“What is relevant to you Watson,” The Effective Detective asked me before I could even sit down. “Sir? I am not quite sure I understand the question,” I replied hoping to gain some time to get my wits about me. “The question is quite simple Watson, what is there to understand or not? What is relevant to you?” The Detective responded doggedly. “Relevant in what way Sir, my business, my life? I require clarification to answer such a question,” I came back started to get a tad irritated. “Ah, thank you Watson, therein lies the problem. You are over thinking this; just as so many of our fellow marketers do. Always looking for the precise question to answer in their content. 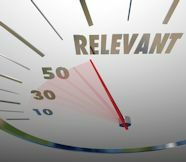 What is relevant to my prospect and customer base? Still looking for that silver bullet of brilliance that will convince them to follow you – or even better, buy from you. Of course there is no single answer to the question, because unless you live in a cave and the only thing that concerns you is survival, there are many things in life and business that are relevant to you,” The Detective took his traditional pause here and waited for me expectantly to respond. “I understand how the question could be answered now sir, but I’m still unclear as how this can help our readers,” I blurted out, still dazed, and waited for the blistering rejoinder I felt sure to get. “Watson, we must work on your tedious tendency toward denseness. My query was simply meant to make you see the true possibilities of content marketing. The plaintive cry of ‘I don’t know what to write’ that we hear so often, is because we don’t think this through. We know that unless people are truly interested in us as people, that making ourselves the focus of our ezines and posts won’t be accepted, but relevance to any person can span business and personal. “Personal anecdotes, or outside events or information can sometimes be related to a business point, and sometimes they are just plain interesting. Remember that people love stories. Content does not continually need to be tips and tricks. Sometimes it can be a story that reinforces a previous lesson. Or maybe it can simply be entertaining. “My friend, coach, and mentor Ruth Sherman critiques the presentations of various presidential candidates as the election comes near. The content is interesting and entertaining even though few if any of her clients like me are contemplating a presidential run. However, some of the points she reviews can be related to speaking for business. She maintains relevance!” At this point the Detective stopped and gave me a sharp look, encouraging me to try and have an interesting rejoinder. “So using not only pure information relevant to the business at hand, but also thinking of your content consumers as people and mixing in, for the lack of a better word, stuff, that might be simply interesting or entertaining can maintain relevance. with your list Sir, one’s content library would be infinite!” I responded, with a growing sense of excitement. “Thank you, sir,” I replied not sure if I had just received a compliment or not, but decided that retreat is the better part of valor for the day.